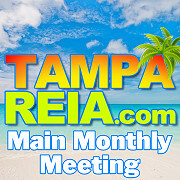 The Main Tampa REIA Monthly Meeting is held on the 2nd Thursday of each month at 6:00 PM at the Doubletree Suites Tampa Bay located at 3050 North Rocky Point Dr West in Tampa, FL. This is our Main Tampa REIA Meeting for the month, so don’t miss it! Be sure to bring a pen and paper to take lots of notes, plenty of business cards for networking and flyers for marketing your investment properties for sale. Cost? Tampa REIA Members can attend for FREE & Guests Can RSVP Online Now for $15 or Pay $20 at the Door. But wait, there’s more! After the conclusion of the Tampa REIA Main Meeting (around 9:30 PM), we will be reconvening at Bahama Breeze located at 3045 N Rocky Point Dr E in Tampa for the “Meeting after the Meeting” with Scott Siegle and the rest of the Tampa REIA Crew. Come eat, drink, network and have fun with us as hang out late into the night on Tampa Bay! Why? To Learn More, Network More, Market More and Have More Fun!